It was a dream they held for nearly two decades. From the time the lodge’s charter was granted in 1910, the membership held meetings in a variety of halls in Portland including the Alisky Building at 3rd & Morrison; the Selling Hirsch Building at West Park & Washington; the Good Templor Hall; and finally the Pythian Building at West Park & Yamhill. In the early 1920s, Grieg Lodge began in earnest to plan for a permanent home. As word spread through the community, several opportunities arose to buy space with other organizations or purchase existing halls which were being sold, among them the WOW Hall and the Swedish Harmony Hall. But each time, the membership rejected the idea, preferring instead to stick with the plan to create their own home despite the greater difficulty and expense. A building committee of three was appointed in late 1924, and within 3 weeks the group had found a 100×100-ft. site they considered suitable at 11th & N.E. Everett. The price was $5,000 cash. A special meeting was called on November 15 in order to vote on this momentous decision. A motion to buy the property passed by a vote of 48 to 5. But a twist was yet in store. Just as the 11th and Everett street property was settled, the lodge received an offer to buy it for $6500. The membership was stunned and rejected the proposal. But the Building Committee began to look at alternative properties in the neighborhood, just in case. They found three, including a 100×100-ft lot for $6,000 at the corner of 11th and Couch. In March a new offer to buy the Everett street site was received – this time for $7250. It was an offer the lodge could not and did not refuse. Franz Bakery expanded there shortly after. The next two years were consumed with raising the money needed for the lodge’s new home at 11th & Couch. Finally, as the nation teetered on the brink of the Stock Market Crash and the Great Depression, Norse Hall was completed in 1928 at a cost of $65,000. 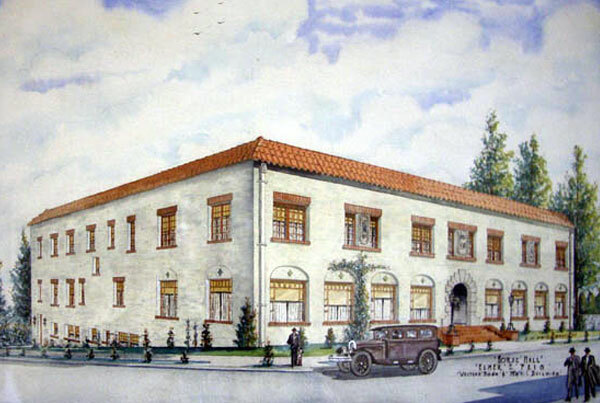 Designed by Elmer Feig, an architect known for his modern, art deco style, the elegant Spanish Renaissance building covered a quarter of a city block and was among the most imposing structures of the time on the city’s east side. The Grand Opening celebration was thoroughly covered by the local press, the Oregonian and the Oregon Journal. The Mayor of Portland, George Baker was on hand for the festivities as was the President of the Supreme Lodge of Sons of Norway, Judge T.O Gilbert and the District 2 President, Halvor Quam. The program included speeches, musical and singing performances in both English and Norwegian, and a dance to the Lloyd Nichols 7-pc. Orchestra. Fifty new members were inducted into the lodge, and a chicken dinner was held the following day. Apart from special events, the Norse Hall Ballroom was the scene of a dance every Saturday night. By 1940, the hall’s signature neon sign had been installed and was a bright beacon on the weekends of the hall’s activity. When World War II began, and Germany occupied Norway, fundraisers were held at Norse Hall to support the Norwegian Resistance. Meanwhile, the Grieg Lodge Leikarringen group performed at bond rallies and at Fort Lewis to entertain the troops. According to Toni Linne, a member of Leikarringen at the time, “Most of the Leikarringen groups disbanded during the war, but Grieg Lodge’s Leikarringen has operated continuously since it started. It’s been the cement at this lodge.” The group lost its accordion player in battle. Shortly after the war ended, Grieg Lodge threw another party. This time to celebrate the burning of the mortgage. Norse Hall was finally paid in full. In the decade between the early 60s and early 70s significant remodeling projects were undertaken to upgrade and modernize the aging building. It was during this time that many of the original elements of Norse Hall were changed or sacrificed. A huge mahogany bar with a brass foot rail was removed from the basement, and the Oslo Lounge was created where the Ladies lounge had been on the main floor. The open balcony surrounding the ballroom was sealed, lighting fixtures were changed to fluorescent strips, ceilings were lowered, aluminum windows went in on the upper floor. The 1970s also saw a series of large special events at the hall. As Bob Lee recalls, a variety of choral groups from Norway came through on road tours and performed at Norse Hall. The lodge was also deeply involved in the 1976 Bicentennial Folk Fest. A Sons of Norway District Convention along with the 150th anniversary celebration of the Norwegian immigration was held at the hall. It was also during this time that a church, Grace Fellowship, used the hall for several years as its base while funds were raised for their own building. The income from their tenancy is credited with keeping the hall afloat through some difficult financial times. It was the church that bought and installed the chair lift in the back stairway. In 1985, Grieg Lodge, which was founded in 1910, celebrated another landmark – its 75th birthday. The lodge’s diamond jubilee was marked by a huge sit-down dinner in the ballroom. Further building projects were also pursued during this decade. The air conditioning system was added, the “new kitchen” was excavated and built, and the library was moved downstairs next to the main dining room. Once again, most of the labor for these projects was handled in-house, and as Bob Lee notes, ” Big John Jensen” played a key role in all of them. Throughout these years, a variety of non-profit and ethnic groups rented Norse Hall for meetings and events, including the letter carriers union, the submarine veterans, Sesame dance group, Norske Runddansere, the Danish Lodge, Swedish Linnea, League of Swedish Societies, Daughters of Norway, and the Scandinavian Ladies’ and Men’s Chorus. Many are still with the hall today. Few major building projects took place in the 1990s at Norse Hall, but many repairs, equipment purchases and upgrades were undertaken. The volunteer office was created, and the cloak room became a shop (“Landhandel”) and computer room. The maple floor in the hallway upstairs was uncovered and restored to its original condition, hinting at what might be hidden beneath the tile flooring in the Old Library. Portland’s historic Norse Hall entered the new century in need of many improvements and repairs – understandable for a building of its age. Several are underway. The Ladies Social Club, ever the movers and shakers of the Lodge, redecorated the ladies lounge upstairs, along with the Nordic Room. Dedicated members including Mark Halvorson, Carl Passche, and Hakon Andersson are spearheading numerous projects throughout the hall, the most important of which has been the complete restoration of the original Library just in time for the hall’s 75th birthday. From its exquisite maple floor and woodwork to its 13-foot ceiling, this beautiful room is a testament to what can be achieved by an all-volunteer, non-profit organization with vision and determination. And that’s how it has always been. From the very beginning, the members of Grieg Lodge have worked hard – first to build and then to preserve their beloved home. Norse Hall has been both a treasure and a taskmaster to each generation of its caretakers, demanding much, but also offering much in return as a touchstone that holds its family together. Although many heritage halls were built in the early part of the 20th century by the Scandinavians who came to America, few remain today. Those that do represent a legacy reminding us of their commitment and dreams for the future – something Norse Hall’s builders knew a lot about, and still communicate to us today as we work and play within the walls they constructed. Many thanks to Portia Hall, Bob Lee, Christie Stilson, Betty Moorman, Kathy Gasperson, Howard Johnson, Audrey Patterson, Toni Linne, Edna Koroch, and Mike Thompson for their invaluable assistance on the History of Norse Hall.